Alison was born and raised in Kent, but now lives in Co. Offaly having moved to the Irish Midlands with her family in 2008. Alison has always felt at home in the outdoors and enjoyed full days as a child exploring woodland near to her home, studying for A-levels in the crook of an old oak tree in the Lake District and den building, singing and chatting around camp fires as a student at University. Keen to refine this affinity, she completed the first of a number of formal bushcraft courses in 2003 and met Paul on an Intermediate Bushcraft Course that he led a few years later. 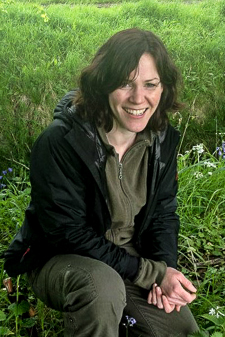 Alison has spent many years sharing her enthusiasm for all things nature and bushcraft with both children and adults in her roles as primary school teacher, green schools and environmental awareness co-ordinator, scout leader and head guide with the Irish National Parks and Wildlife Service. She has led many and varied events including foraging walks in both urban and rural settings, bat talks and walks and guided discovery walks which focussed on the formation, flora and fauna of one of Europe's best preserved raised bog habitats in Clara, Co. Offaly. In her spare time, Alison can often be found somewhere in the countryside with her son, daughter and family dog Luna, tracking, harvesting wild food, collecting materials for basket making and carving or tending her bees. Alison is a keen medieval re-enactor and enjoys researching and putting into practice many of the traditional skills of the time including the making of homebrew, archery, calligraphy and woodcraft. Alison is also fascinated by indigenous culture and enjoyed learning about religious experiences of various tribes as part of her first degree where she studied the magic, shamanism and rituals practised by the Iban of South East Asia. Love of this subject prompted Alison to explore many countries and discover some exceptionally beautiful wild places along the way, both above and beneath the water. She has leapt into lagoons from the top of waterfalls in Israel, escorted newly hatched leatherback turtles into the sea in Australia and dived with sharks, dolphins and manta rays during the day and lionfish, moray eels and plankton on night dives in the Maldives. Alison joined the team at Frontier Bushcraft instructional team in 2013.